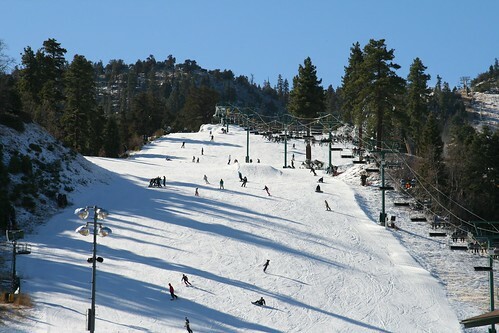 There is a chill in the air as our ski season rapidly approaches in the Big Bear Valley. The temperatures will dip into the teens this week at night and stay below 50° during most days. It looks like a storm will blow in on Friday for the weekend. Dress warm and bring your long johns so you can get outside and enjoy the mountain beauty! Snow Summit and Bear Mountain to open! Good News! Bear Mountain and Snow Summit are pushing for an early opening this week as they are making snow every chance they get. According to Snow Summit’s website, Miracle Mile and Bear Bottom Beginner runs will be the first to open. Keep an eye on the current snow report for up-to-the-minute details on the ski conditions. Bear Mountain expects to open Park Run first. They’ve been making snow since Friday evening and received an additional 4 to 6 inches over the weekend. Check out Bear Mountain’s live web cam to view the progress of the freshly powdered slopes. If you’re planning a visit to Big Bear Frontier to start off your ski season, visit us at the Front Desk when you arrive for discount coupons! Call 1-800-798-3960 to check availability and to make your reservation today. Gallery | This entry was posted in The Seasons, What to see and do and tagged Bear Mountain, Big Bear CA, skiing, Snow Summit, vacation, weather, What to Do. Bookmark the permalink.